Boylan has a new line of water/soda drinks called MASH and they are REALITY. Today I had the Lemon Peel/Ginger Root variety and it was deelish. Its sort of like a flavoured water deal with carbonation but its light. I looked all over for evidence of MASH online for it but couldn't find anything. It must be brand new or Boylan is keeping it secret for some reason. They come in little baby 20 oz. bottles. Its low-cal "natural fruit essence". Whatever that means. Either way, its deelish and I back it 100%. I found a few different flavours hidden on the bottom shelf in one of Bay Ridge's last remaining classic old tyme Norwegian delicatessens. Boylan has been in operation for over 100 years. They're known for using cane sugar in their drinks unlike most other beverage companies which long ago switched to high fructose corn syrup. Their first product was Boylan's Birch beer, formulated in 1891 by Paterson, New Jersey pharmacist named William Boylan. 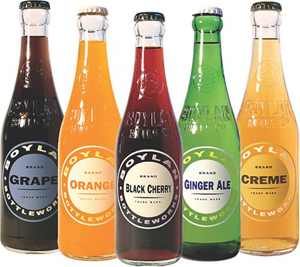 Boylan products are known for glass bottles with distinctive, retro-styled painted ceramic labels. And yea, I dunno why Boylan's is hiding it. I just tried the Pommegranate Blue Berry MASH today and it was wonderful. I've never seen it before and also tried to find it online, all I found what this article. It's an awesome product and i want to know where to get it. I got mine at a catered meeting today so don't know where it came from. But i highly suggest it! I've tried the pomegranite blue berry and the mango one and love them both. They sell all the flavors at Fairway and I also found them at a small grocery store on the upper west- Barzinis. Wish I could find an online retailer who delivered them in bulk. I work at a retail market in the suburbs of Detroit Michigan. Nino Salvaggio International Marketplace to be exact, www.ninosalvaggio.com and we just started carrying "mash" drinks by boylan's. I strongly reccomend trying them all and if your in the area feel free to stop by. Yes, it's delicious. I'm drinking the Grapefruit Citrus Zing now--BUT they bury the fact that it's got Splenda in it. It's the last ingredient on the ingredients list, tucked away secretly, quietly at the end. They don't need artificial sweetener, and I was really disappointed when I figured it out back at my office desk. REALLY DISAPPOINTED! I FREAKED OUT! Interesting, Edith. Had no idea about the Splenda thing. Though, if I've gotta go down swinging, I'd go down with some Splenda. Definitely my fav of the artifical sweetner arsenal. Then again, I still drink Tab when I can find it. My family tried the lemon-peel ginger root mash and the pommegranat blue berry mash while vacationing on Long Beach Island, NJ. Now back home in CT I can't find it, and found this website while looking for some local retailers. Hopefully, I'll find it soon! you can purchase it online at amazon.com....they have boxes of 12 for $30 !!! I couldnt locate it on their website either and was dissapointed after trying one in a nj deli on my way back home! Can't find too many places to purchase it here in Brooklyn,NY . i'd love to find a distributor to get it for little less than the retail price. The Pom/Blueberry is soooo refreshing on a hot, hot day. I've never seen or had the pom/blueberry one. I'm definitely seeing MASH more than I used to but its far from ubiquitous, unfortunately. Its so good, if it were more available I bet it would catch on like wildfire.